I'm just going to start by saying don't buy this toaster unless it's absolutely the cheapest toaster you can find. It's a throwaway toaster, and you shouldn't buy it unless you're okay with throwing it out in a month or a year. The big problem with this toaster is that the heating elements in the middle have gone out. I don't know how old this toaster is, but we only make toast about once a month in my house. I'd guess this toaster has been used less than 100 times in total, and it's already broken. Even when this toaster was new, it didn't really toast that evenly. Some parts of the toaster would be close to burnt while other parts were just barely browned. I'm not a toast connoisseur, so I lived with it, and you probably can too. This toaster is cheap, so of course it's going to break. I bought this toaster because it was cheap. When I replace it, I'm going to buy another cheaper toaster. Toasters are basically just plastic and metal boxes with heating elements in them. They cost like $1 to make. There's no reason to pay more for a more expensive toaster because it's probably just as likely to break. One other nitpick is that the labeling on the side of the toaster wears off really easily. This is probably so that when the toaster breaks, you can't read the brand name anymore. That way you might end up going out and buying the same toaster again. This toaster is still okay for bagels though. I just put the bagels in with the insides facing the hot parts. That way the insides of the bagel get nice and toasty and the outsides don't get burnt at all. This toaster is cheap. It's cheap in terms of price and build quality. I give it a rating of 1 out of 5 because it does at least get hot and toast stuff. It breaks easily and toasts a bit unevenly, so it never really made me happy. 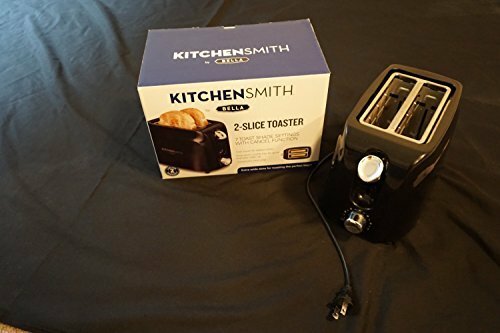 In the end, I only recommend this toaster if you can't find a cheaper one and you're okay with throwing it in a landfill in about a year or so.